We are setting up an SPB network, and I am looking for some optimisations. On the BCB switches which are OS6900, there are no VLANs or IP interfaces configured, except the Management IP interface. In the current configuration we need to configure a loop (hairpin) between a SAP port and a 802.1q trunk port where the management VLAN is configured. Is there a way I could eliminate this hairpin, and maintain the possibility of managing the switch remotely? Or is it possible to map a management IP directly to a SPB service? 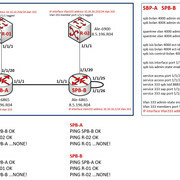 Only with OS9900 and OS6900V72/C32 there is inline routing within SPB possible (bind ip interface to an service). For all other switches you need an other solution. You can create an overlay network (outside of SPB) only for management. You need only one hair pin (so only at one switch) to reach this network. Without this overlay net you need hair pin at every switch. Two 2-GB Phisical NIC for the management of a Virtual Vlan-IP interface ? It's a BUG ? no Bug. The en-/decapsulation of all the packets for SPB occures in the PHY (means direct in HW) - f.e. with 40Gbs (this is not possible in the cpu). The design of the HW (beside 9900) doesn't allow the binding of a ip-interface to an service. Thanks for your reply; can you help me in this little LAB ? In previous releases an IP interface was not permitted on a BVLAN. With this feature enhancement an IPv4 management interface can now be configured on a control BVLAN to provide in-band management access in the SPBM domain. ISIS-SPB is the only protocol supported on this interface, no dynamic routing protols are supported. domain, use the ip interface command. information. No other routing protocol (including VRRP) is supported. for your lab: your config is okay in my opinion. No idea about the reason for this strange behavior of reachablity. Meantime I have seen this new feature in 8.5R4 too - but not tested yet. I hope it will work. Have you configured this?